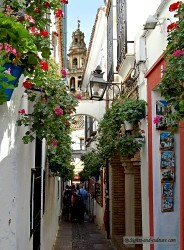 Córdoba is the capital of the province of Córdoba in the autonomous region of Andalusia, in southern Spain. It is situated on the banks of the Guadalquivir river, not far from the Sierra Morenathe mountains, known for their mineral wealth. 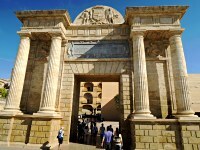 The city's history goes back to an Iberian settlement, which was conquered by the Romans in 169 BC. 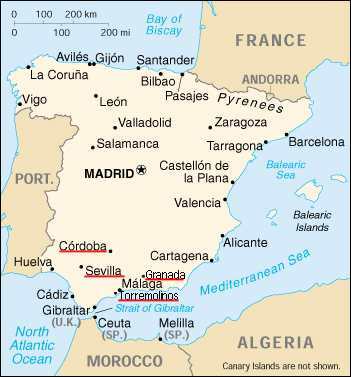 At the time of Julius Ceasar Córdoba developed into the most important city of southern Spain. One of the most beautiful examples of Roman architecture from this time is the Roman Bridge over the Guadalquivir River (1st cent. BC), with a length of about 250 m and 16 arches. 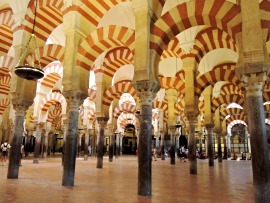 With the Moorish conquest in 711 Córdoba came under Arab rule for hundreds of years, in fact until 1236. At first the city became a provincial capital, subordinate to the Caliphate of Damascus, but when in 756 the Caliph of Damascus set up his court at Córdoba, the city's most glorious period began. 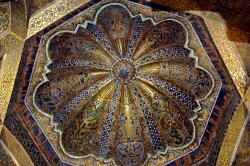 It became capital of the independent emirate of Córdoba (756 - 929) and finally advanced to the head of the Caliphate of Córdoba (929 - 1031). 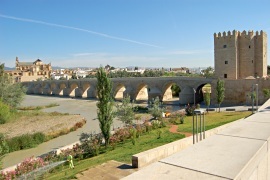 In the 10th century Córdoba was the largest, most prosperous city of Europe, outshining Byzantium and Baghdad in science, culture and the arts. In 785 the construction of the Great Mosque of Córdoba (Mezquita de Córdoba) was begun on the site of a Roman temple of Janus, which had been converted into a church by the Visigoths. The building complex was expanded over the following centuries and finished in 987. With an area of over 23,000 square meters the Great Mosque of Córdoba (Mezquita de Córdoba) is one of the largest sacral buildings in the world. The magnificent, arcaded hypostyle hall with 856 columns of jasper, onyx, marble, and granite is of awe-inspiring grandeur. After the reconquest in the 13th century, under Ferdinand III, the Great Mosque was turned into a cathedral. The most significant alteration was the building of a Renaissance cathedral nave right in the middle of the expansive structure by permission of Charles V, king of Castile and Aragon. However, when he visited the completed cathedral he famously commented, "they have taken something unique in all the world and destroyed it to build something you can find in any city." The charming, well-preserved historic centre belongs to the UNESCO World Heritage, not least because it still to this day gives a vivid idea of the different cultures that have lived here, at the banks of the Guadalquivir. 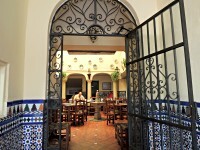 An especially enchanting feature are the lovely patios, typically with a small fountain in the centre and decorated with beautiful tiles, stone mosaics, plants and flowers. 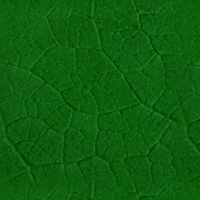 They have been built troughout history as a way, to keep the homes cool in the hot climate. 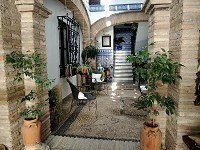 Since 1993 every year in May, the city celebrates its traditional Cordoba Patio Festival, where the most beautiful patio is elected. Home owners open the heavy iron gates revealing the breathtaking beauty and flowerage of their elaborately decorated court yards, windows and walls; a feast for the eyes! In 2012 the UNESCO declared the festival a Masterpiece of the Oral and Intangible Heritage of Humanity.